Kalona Creamery includes a shop and deli featuring house-made ice cream, butter and cheese curds. 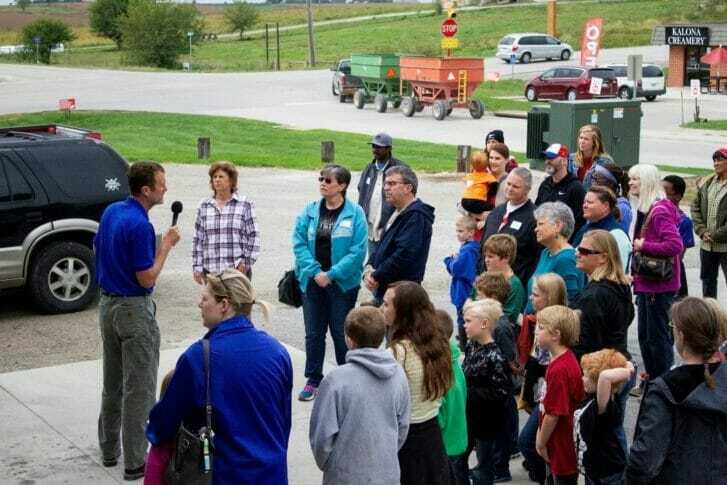 Creamery staff led 113 field day attendees through the history of the creamery, shared the creamery’s cheese making process and discussed the logistics of the sourcing local milk at Kalona Farms. Field day attendees sampling some of Kalona Creamery’s freshly made cheese curds. Since 1946, Kalona Creamery has been producing cheese with milk sourced from surrounding farms. It was first named Twin County Dairy and became the Kalona Cheese Factory in 1970. In 2014, the Kalona Cheese Factory closed due to the challenge of increased regulatory requirements. Loyal fans then promoted a social movement, #SaveThenSqueak on Facebook to revive the cheese factory. A year later, Kalona Cheese Factory was sold to Open Gates Group, a family of eight local entrepreneurial companies was reopened under the name Kalona Creamery. The newly renovated creamery offers in-house made cheese, butter, ice cream and a shop and deli selling local Iowa foods. 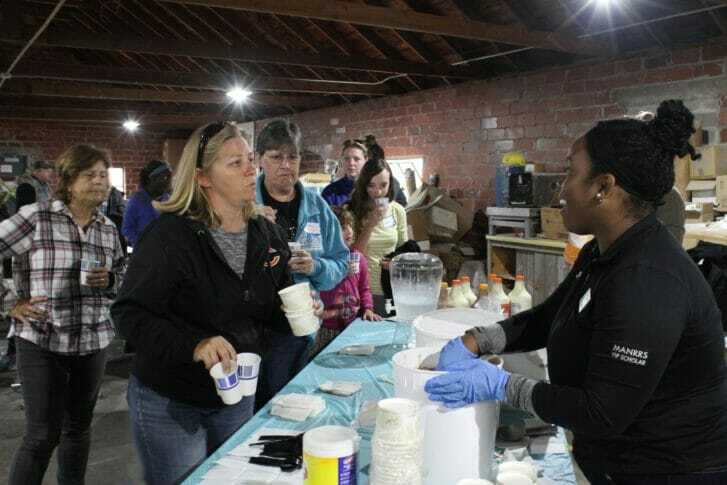 Field day attendees in line to sample Kalona SuperNatural™ milk and ice cream. Farmers Creamery uses batch pasteurization. A batch pasteurizer consists of a temperature controlled, closed vat. The milk is pumped into the vat, heated slowly to the temperature of 145°F, held at that temperature for a minimum of 30 minutes, cooled and then pumped out of the vat. Phil was asked how Kalona Farms regulates the use of antibiotics. “Every time we have a load come in, we test the milk for antibiotics. When we pick up milk, a vial of milk is collected at each and every farm to test for antibiotics – narrowing down the source of contamination if one occurs. Our rules are if a batch of milk tests positive, that farmer is responsible for buying the load (tank) of milk, which equates to about $30,000,” explained Phil. If you want to hear more about how Phil manages Kalona’s organic milk production, check out the video below. 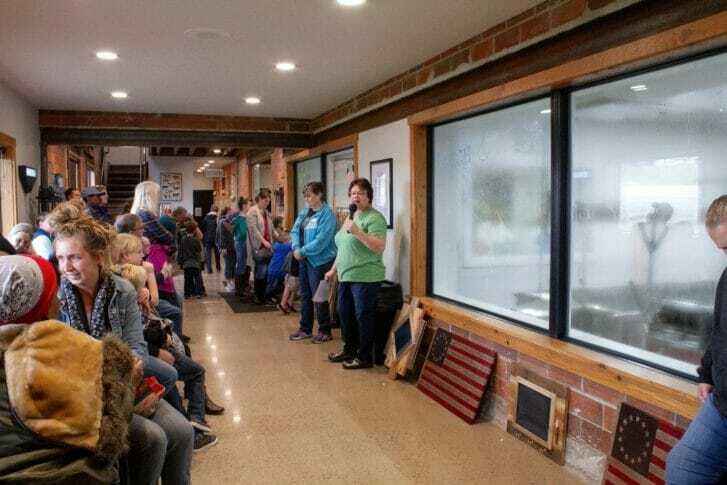 Sue Gessner, Quality and Product Development Manager for Kalona Creamery, led field day attendees through the process of cheese making and ice cream development. In August 2018, the creamery started the production of cheese curds. Kalona Creamery has been historically known for its cheese making since 1946, but in April of this year began producing eight flavors of house-made ice cream. Sue is in the process of coming out with fall flavors such as pumpkin chai and caramel apple pie. She’s also developing eggnog and peppermint flavors for the winter. 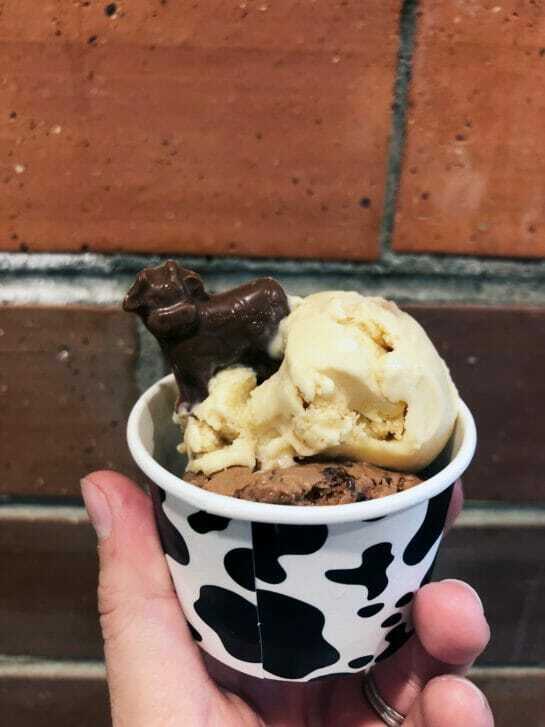 Chocolate and Kalona Crunch ice cream topped with a chocolate figure of Lona, Kalona’s favorite dairy cow. “The entire cheese making process takes about four hours. The process begins with raw milk from Farmers Creamery and Kalona Farm. After the milk is pasteurized, it goes through the piping into a rectangular vat, where the milk will be about 91°F, which is perfect for our culture to ripen. The culture is a good bacteria to help develop the texture and flavor of the cheese. A full vat takes about 8,600 pounds of milk to fill, and we get about 860 pounds of cheese at the end of the process, getting 10% of what we put in, out as cheese,” described Sue. “Kalona Creamery has been around for 71 years but we just purchased it in 2015. Our cheese making process is different from the process that was being done here years past. Now our cheese is being made with a smaller footprint,” shared Sue Gessner, Quality and Product Development Manager. After the culture has ripened and the flavor profile has been developed, a vegetable-based rennet is added to the milk. Once the rennet is added, it sits for about 30 minutes allowing the milk to thicken and curdle. As it thickens, harps are used to cut the cheese into little squares, creating curds and whey. After that, paddles moving back and forth with added heat to begin separating the curds from the whey. Kalona Staff bagging up freshly made cheese curds for customers. “Our goal is to get out as much whey as we can and develop acid into the product. Curds will sit on either side of the vat so they can solidify, and once they have reached the right thickness and firmness, we will put them through a mill to cut the slabs of cheese into bite-sized pieces,” shared Sue. How do cheese curds get their squeak? “The last step in the process is salting the fresh curds. The salting process is key for developing the squeak, but also helps the curds to develop their flavor,” shared Sue. The squeak comes from the curd’s tough mesh structure of protein and calcium. When you bit into a cheese curd, the tough mesh resists the bite. That resistance is what causes curds to squeak. As time passes and the cheese is refrigerated, you can lose the squeak, but if you microwave it for several seconds the squeak will return! Thank you to all the staff of Kalona Creamery and Kalona Farms for hosting a great field day full of tasty and fresh treats made from local Iowa milk! Check out Kalona Creamery’s Facebook and Instagram page to see great videos and pictures of their cheese making process.